We are delighted to celebrate that 23 delegates went through to certification on our Choral Music Experience course this year. Half were returning conductors for the second, or third time, deepening their singing, teaching and conducting practice, half were new to the course. Feedback was resoundingly positive. “It has made me think a lot about what I’m doing physically when I’m standing in front of a choir. I have loved learning from such fabulous Experts” Head of Music, Lister Secondary School. The next course dates will be announced in the summer, so please watch this space! We Continue to work with Bromley Youth Music Trust (BYMT) to create new songs with the children learning within Bromley Special Educational Needs Units. Having completed workshops for children in KS 1, we are now working with children in KS 2, teaching active warm up and engagement songs and facilitating song making based on topics the children are working on. Everything from The Tempest, or Electricity, through to Dinosaurs. Click here for the first draft recording! The children are now set to practice their songs and will be sharing them with other participating schools in the summer. This project is funded through Youth Music. Final versions of the songs will eventually be uploaded onto the BYMT website for all schools to be able to download and learn in relation to the Primary Curriculum. The NewMen boys only choir project is coming to the end of it’s pilot phase. We have chosen to focused our energy on just one venue Beckton Globe Library for this project. This is as much because of their incredible support, but because we have identified a strong need for engaging, fun, safe activities for boys in this area. We are encouraged by the growing numbers of boys wanting to join the group. For the last two week the lead team of young male artists have offered workshops in surrounding schools on a voluntary basis to ensure that boys in the area know about the opportunity. We now hope to continue the project into the summer months. NewYVC, based at Stratford Circus is in full flow this term. The young artists are delivering workshops in 22 schools, along with a music peripatetic from the Newham Music Trust. This is towards the cluster rehearsals coming up at the end of March and the four nights of our Summer Sing in July. The choir also had an opportunity to work with Helen Yeomans in preparation for their part in One World London in April and May. This is a series of four performance events across venues in London, raising awareness of how we need to absolutely start looking after our world. A representative of Amnesty International described it as “One of the most moving musical events I have ever been to”. For ticket info nation, please click here. Please come and support NewYVC and the One World Choir! They are also preparing for a special night as a ‘Give-A-Gig’ on Sunday 7th April to raise funds for, and awareness of Youth Music. We will be welcoming special guests, The Smithsonian Jazz Masterworks Orchestra all the way from Washington DC. You can pre-book your tickets here. The SJMO is made up of 17 incredible jazz musicians who call Washington, D.C. home. Many thanks to CILIP who contacted Living Song last month, asking us to provide a special performance for the launch of National Libraries week on Tues 9th Oct. Our Young Artists performed at the House of Commons, Portcullis House, Westminster for an audience of MPs, Librarians and other important guests. NewYVC Senior Artists sang a range of a capella repertoire, including a South African medley, a Michael Jackson song and Higher and Higher, by Jackie Wilson. The audience clearly enjoyed the performance and spent time afterwards talking with members of the group. The organiser said: “A huge thank you to you and the choir for an incredible performance at the House of Commons on Tuesday. What a spectacular event that was made so special by the choir’s outstanding performance which brought joy to everyone in the room. It created such a fantastic atmosphere and lots of people told us how much they had enjoyed the performance and getting to meet and speak to members of the choir”. Natalie Jones. The month of October is Black History Month. As part of the celebration, Living Song is running creative sessions in four libraries, working with Journey to Justice. Drawing on film, discussion and song making, the local community are sharing their idea’s and feelings about Black History Month. So far we have made three new songs, one at Stratford Library, one at East Ham Library and one at Plaistow Library where over thirty men, women and children from our diverse community collaborated to create our third song in the project. Participants engaged strongly with the activity, singing and chanting their own words as the song emerged. On 26th October, we are inviting all our community song makers to come to Stratford Town Hall to sing their new songs, with local artists who have helped facilitate the making of the songs. Everyone is welcome. The sign up for Choral Music Experience (CME), London has gone really well again this year. We have twenty-four delegates, many of whom are returning to continue deepening their practice through CME. We are bringing Nick Page over from the USA for the first day of CME on 3rd Nov. He is an inspirational teacher, conductor and composer. Living Song is hosting his visit, during which he will be the guest of honour for the first Cluster rehearsals of Newham Harmony, and of the launch of the primary singing programme with Ark Schools. The CME course follows the repertoire-based curriculum emphasizing the essential elements of singing and conducting, score study and rehearsal planning, choral pedagogy, and performance practice. The CME performance approach emphasizes the quality of joyful, socially engaged and reflective rehearsal pedagogies practiced collaboratively for the artistic, education, and psycho-spiritual benefit of singers and their communities. For more information go to Choral Music Experience Institute website. Members of NewYVC choir continue to develop their musical, social and professional skills as young artists. Several members have now left the choir to become Associate Artists and are leading their own choirs and workshops. Young Music Mentors have been appointed as Young Artists and new younger members have now become Young Music Mentors (YMMs). We are very keen to grow the choir. Any young people aged 10 – 18 who love to sing should come along to Stratford Circus on Tuesdays after school and try a session with this unique and remarkable group of young people. The singing activities are both accessible and challenging, and the leadership team; Jane Wheeler, Naveen Arles and Steve Lodder learn as much from the young artists as they learn during our sessions. The massed singing programme with NewYVC at it’s core is funded by Youth Music once again for the next three years. We will continue to work with Stratford Circus and a new partner, the Newham Music Hub. 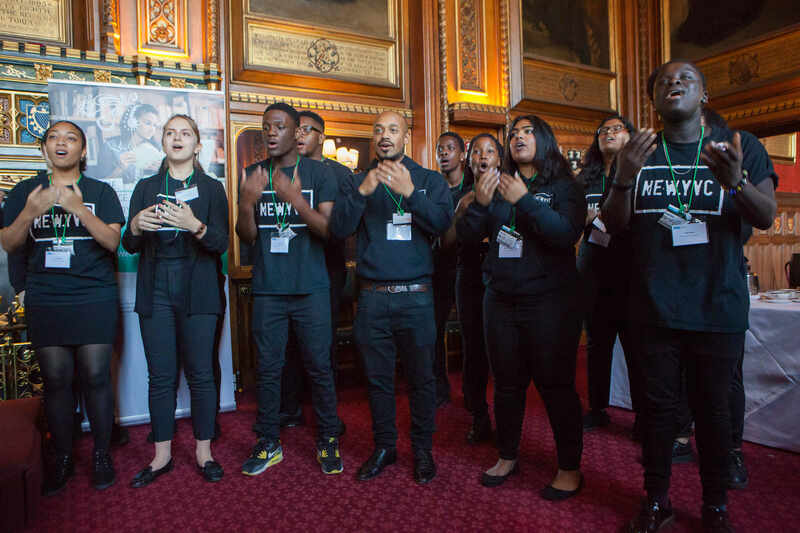 NewYVC will continue to raise expectations about what young people in Newham can achieve through singing and will work with Newham Music teachers to run workshops in Newham schools. The repertoire for Newham Harmony continues to be diverse in style and origins and sets a range of enjoyable challenges for children, conductors and teachers. This includes music of J.S.Bach, Nick Page, Kathy Armstrong, traditional Japanese and Bengali songs as well as The Beatles and Bruno Mars. Living Song continues to co-manage with Newham VIth Form College this term. The students played a strong role in the Music and Freedom project with Journey To Justice as we reported in Spring. Their singing leader Marina Hart and accompanist Dian Gasper continue to inspire the young singers, who recently made a strong contribution to our massed singing event at Stratford Library for Libraries week.